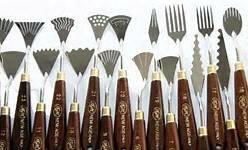 Painting Knives for use with Cold Wax Painting Medium and oil paint. 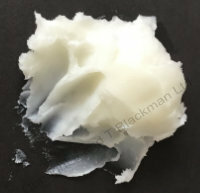 One of the main tools for use with Cold Wax Medium are Painting knives. These knives are available in a large variety of shapes and sizes, however, knives with a 'cranked' handle are often the preferred type. The best ones have blades made of stainless steel and the tip of the blade, is thin and has good flex. The image left gives a good idea of the types, styles and makes available. 'Trowel' or the 'Tear-drop' shape are good ones to start with, the 'crank' of the handle keeps knuckles out of the paint. Knife painting allows for expressive, impasto and texture in your work, learning to use the knife leads to tangible effects and sweeping areas of flat colour. *Be aware, not all painting knives that purport to be 'stainless steel' are, test the flex of the knife, the blade should spring back to normal, if not, return it! Use them to mix the oil paint and Cold Wax together, or solvent and wax for a glaze, you can of course paint with them if you wish. Most Painting knives have a cranked handle, this makes it easy to apply the paint without learning a new 'grip' and gives space for the knuckles of the hand above the paint. 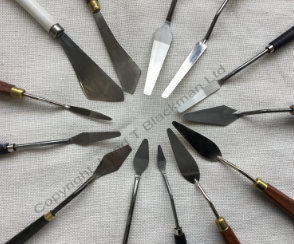 These painting knives have a wide selection of unusual shapes and configuration of tines, giving many opportunities to add line work and pattern to your wax/oil painting. There are a couple of video on their site - worth a watch.